These little fritters are a great alternative to blini. They are perfect with crispy pancetta as well as smoked salmon. Place half the sweetcorn with the coriander in a food processor and blend until roughly chopped. Add the egg, flour, baking powder and crème fraîche, then season. Blend until combined. Pour into a clean bowl and stir in the remaining corn and chopped salad onions. Place a little oil in a heavy-based frying pan over a medium heat. Drop tablespoons of the batter into the pan and cook in batches for 1 minute on each side. Drain on kitchen paper. 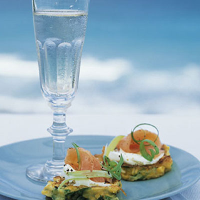 Place the fritters on a serving platter and top each one with a little crème fraiche and smoked salmon. Garnish with shredded salad onion. Place the shredded salad onions in iced water for 30 minutes and they will curl up beautifully for garnishing.